The One World Wellness approach to teaching yoga to young people is comprehensive, imaginative, and playful. Children love to learn yoga through posture practice, art, games and story. 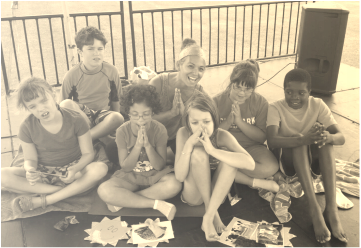 To help them embrace the messages that learning yoga is fun and that exercise is feels good, One World offers the following programs that bring these lessons into children's hearts and into the rest of their lives! Please scroll down to choose a payment option via PayPal for this weekend training. 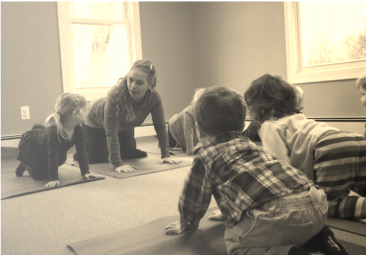 For ages 2 - 11 years, this weekend training is geared towards teachers, parents, caregivers, OT's, PT's, yogis, and everyone who loves working with children. It incorporates music, stories, games & props in an exciting way that engages any child from toddler to 6th grade. The training is held on a Saturday August 8 & Sunday August 9 from 9 am to 7 pm both days. There will be short breaks throughout, as well as breaks for lunch or dinner. Please see Full of Joy's website for more info on the topics covered, CE/CEUs and cancellation policy. Participants must have at least one year of yoga class or similar experience. Includes a teaching certificate, a teaching manual, Lani's FOJY kids yoga book and opportunities to observe, assist or teach yoga classes with Lani Rosen-Gallagher. Recognizing that children need balance and focus in their lives, Lani first incorporated yoga into her daily schedule while teaching first grade in Coney Island, Brooklyn (New York). She received her 200-hour certification from the Nosara Yoga Institute in Nosara, Costa Rica, and then, building on her extensive experience with young children, she went on to be certified by Next Generation Yoga in NYC & Nairobi, Kenya, the Radiant Child Yoga Program, Street Yoga, Circus Yoga & Baby Om Teacher Trainings. In 2004, Lani founded/created Full of Joy Yoga in San Francisco, and in 2007, she relocated to Connecticut, bringing her expertise to the East Coast. Training others to teach yoga to children is one of Lani's passions, as she realizes she can reach many more children by sharing her skills and talents with other adults. Since 2006, she has organized and led Kids Yoga Teacher Trainings for parents, teachers, and yogis all over the country. Lani teaching young children yoga at Alphabet Academy in Hamden. Please choose your payment rate and click Pay Now to register for Full of Joy Kids Yoga Teacher Training. * If choosing the $200 payment plan, you must make two $200 payments by July 31 for a total of $400 and pay the remaining fee at the first day of training on August 8.